Old Cats need to be approached with caution and time must be taken so as not to over stress them. Their skin has become wrinkly and loose in old age and therefore much more difficult to clip. Sometimes it is better to groom an old cat in two sessions rather than one. Difficult cats are sometimes easier to do than other cats, a difficult cat is often a fearful cat, once the fear has been overcome the cat becomes relaxed and quite easy to groom. 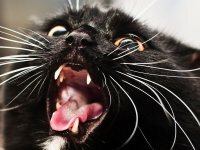 Very angry cats can be done by using a couple of saftey measures which ensures the cat will have difficulty in attacking the Groomer! Cats are more difficult to groom than dogs, they only want to be handled on their terms and therefore restraining them for long periods is highly stressful for the cat. 99 times out of a 100 the most difficult cat can be groomed – very rarely is there a cat that can not be groomed, but it does happen from time to time.